Saxophonist Anton Schwartz was born July 16, 1967, in New York, New York. According to the bio on his website (link below), he began playing clarinet at age 12, then switched to saxophone at age 14. While he was in high school, he formed a jazz that included future jazz greats Larry Goldings and Peter Bernstein. He also had the opportunity to perform live with two of the biggest names in jazz history, Lionel Hampton and Woody Herman. After high school, he studied jazz in college for several years, then took up advanced mathematics. In 1989 he earned a Bachelor’s degree in Mathematics and Philosophy at Harvard University. Eventually he earned a Masters, and then walked away from it all to play jazz professionally full time. Schwartz currently is based in both Seattle, Washington and Oakland, California. He has released four albums as a leader. The one I want to tell you about is the most recent, the 2006 release on his own AntonJazz label, “Radiant Blue”. There are ten songs on “Radiant Blue,” all but one written by Schwartz. The first song is “Phantom Dance”. As you might expect with a title like that, it is a lively song that jumps up and takes off running right from the start. Guitarist Bernstein, he of Schwartz’s high school band, takes the first solo. His meticulous fretwork is impeccable and sounds delightful. Schwartz comes in behind Bernstein with his big tenor, a sound that the San Francisco Chronicle has called a “warm, generous tone”. Pianist Eigsti takes the next solo delightfully forceful before Schwartz steps up again and the whole crew takes it almost to the end, with Bernstein slipping in a quick, quiet riff as it fades to nothing. Up next is “Alligator Strut”, as funky a piece of business as any you’re likely to find. You cannot listen to this song and be sad. The music is just too damn upbeat and, yes, happy! The rhythm section sets a blistering pace, and Schwartz and Eigsti are more than up to the challenge of keeping up with them. Here is Anton Schwartz performing “Alligator Strut” live. The group with him is the same group of musicians who recorded “Radiant Blue”, with the exception that the guitar player in the video is Julian Lage instead of Peter Bernstein. The third track brings us the only non-Schwartz composition, an animated arrangement (by Schwartz) of the Antonio Carlos Jobim song, “The Wave”. I must confess to ignorance of the provenance of this song, beyond the fact that Jobim wrote it. Nor have I previously heard any version except the one presented here. That does not keep me from saying that in the capable hands of Schwartz and company, “The Wave” is an amiable song. Bernstein and Eigsti take great solos, as does Schwartz, of course. Everyone jumps in for a wild, big finish that fades to silence at the end. We are back to Schwartz originals for the rest of the album, and “Slightly Off Course” is the rather interesting title for the next song. I have resisted the temptation to email Schwartz and ask him about that. The head is a quick vamp with bass and piano, and they are joined in short order by Schwartz and the others. The pace soon quickens even more, and “off course” or not, we are soon steaming away at full speed. The rhythm section always drives a song like this, and these guys obviously have pulled out all the stops. Here is an interview with Schwartz that appeared on a Bay area TV station in 2005. The next song is called “Life & Times”. As with the previous song, “Slightly Off Course”, it would have been nice if Schwartz had used some space in the liner notes to share with us a little something about this one and what it means. After an almost but not-quite irritatingly-repetitive, sing-songy head, “Life & Times” settles down into a quiet ballad, a welcome change of pace from the energetic first half of the album. “Life & Times”, at 7:43 running time, is the longest song on the album. I don’t like to be negative, which is why I won’t write about any album I don’t like. Having said that, I do have to be honest and tell you that, frankly, the resurrection of that opening vamp got on my nerves. There is a false ending at five minutes in, after which the pace does quicken some and the vamp fades into nothing. Then the vamp is back for most of the rest of the song. In my opinion, the song could just as well have ended at the false ending. The YouTube clip below appears to be “Life & Times” borrowed (ahem) from “Radiant Blue”. No information is given as to who the musicians are, but the running time is pretty much identical with the CD version, and the opening sounds the same. “Marcel Marceau” is a delightful song, presumable an homage to the legendary mime and actor of that name. Big, bold, and loud, the song sonically is the opposite of its namesake, whose reputation as an adroit, silent performer was of almost mythic proportions. This is a great vehicle for everyone to show their stuff, and even drummer Bulkley finally gets a nice solo. The next song, “Blues For Now”, has a beginning that has been driving me crazy because it reminds me of something, and I’ll be darned if I can remember what! Pushing past that, “Blues For Now” really brings out the big, warm sound of Schwartz’s tenor sax. Shifflett’s bass walks a brisk pace and keeps everyone nicely grounded. I’m going to leave the final three tracks for you to discover on your own. Needless to say, I believe you will find “Radiant Blue” to be an outstanding addition to your personal playlist, for a Saturday or any other night! 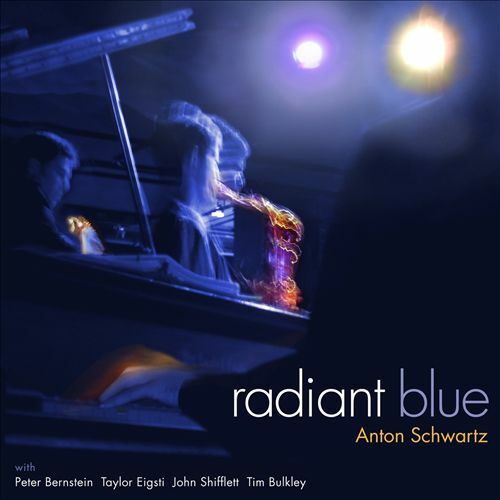 You can find “Radiant Blue” and Anton Schwartz’s other albums available online in all the usual places. To learn more about Anton Schwartz and his music, drop by his web site or catch up on his latest doings on his Facebook page. Your comments about this article and/or the subject are welcome! Please click the “Comment” link below. Rude, abusive comments and spam will be deleted.